It is our intention to give the Order of Service for the coming Sunday on this page. All vistors are welcome. Please feel feel free to feel in any pew. Tea & Coffee – will be available in the Church Centre Hall at the close of the service. Please join us for fellowship. Pastoral Care Committee meets on Wednesday 24th April 2.30p.m. 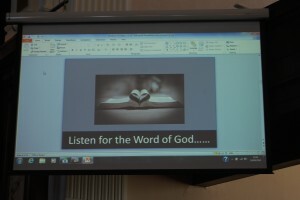 Kirk Session meets Wednesday 1st May at 7.30p.m. Evening Service – Our next Evening Service is on Sunday 28th April. We will gather together for a café style service with a Christian Aid Theme. Rhapsody on Saturday 27th April at 7pm. Tea & coffee will be available in hall after film. NOOMA – – Nooma is back again, this time in the afternoon. We will meet on Wednesday the 8th/15th/22nd/29th of May from 12-1. Nooma is a series of short films that explore our world from a perspective of Jesus. Come and join this relaxed and informal discussion about the film over food and refreshments. If you can only make some and not all of the sessions, that’s okay. There is no pressure to take part, it’s fine to just sit and take it all in, EVERYONE IS WELCOME. The financial appeal on Mother’s Day raised £325 for the CrossReach’s Guardian Angel appeal. This money will be used to support expectant and new mothers who have had a difficulty pregnancy and traumatic labour. Thank you for your generosity. journey through Holy Week with the Moderator, GOD IS THE HEART, the work of the Rev Dr Sam Smith. There is also an article on our links with Venda, I have photocopies of the article available. During building work in the centre foyer, subscribers magazines will be on the table at the bottom of the north stairs. 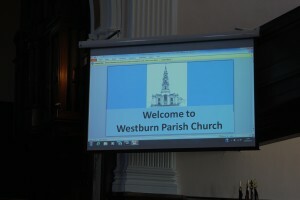 “I love Westburn Parish Church because…” What do you love about our church? Is it the sense of community? Worship? The people? Our Social Media team will be out and about looking for you to appear on our Facebook and Twitter page. All we ask is for everyone to think about what they love about our church and we will ask if we can post a picture of you holding a sign which says “I love Westburn Parish Church because…,” with your reason above the photo. It is all fun and will be great for engaging with our 250 plus followers on Social Media. Who knows it might encourage them to think about coming to join us? For more information speak with William, Morag and Judith. Cruise ships – We will once again welcome visitors from the cruise ships. We open from 10am – noon. There is a list of dates for volunteers please add your name if you can help. For further information speak to Cath Barbour. Heart & Soul – Sunday 19th May we will be running a bus to Heart & Soul this year. We will share in worship and in transport with our friends from neighbouring congregations. There will be a service in Westburn Parish Church, Greenock at 9.30a.m. with the bus leaving from there at 11a.m. enabling us all to arrive in Edinburgh in time to enjoy the full Heart & Soul programme. The cost of the bus will be approx 8 – 10 pounds per person. Please add your name to list in foyer by Sun 5th May if you wish to attend. Speak to Karen for more information.